I love my American desserts, but once in a while, I need to bake a dessert that is molto Italiano…very Italian! It’s not just me that needs it…it’s mostly my husband. You see, he misses his mamma. And all her fabulous crostatas and tortas. So do I. I really, really DO! I charmed my husband when I met him with my pancakes! Yes, my pancakes. Every Sunday when he would call his mamma to say hello we would have just finished eating breakfast. It was usually pancakes, as it still is today. She was expecting him to say, “I just had homemade lasagne.” Mamma was a little worried for her son’s well being and his diet. Since then, I have progressed to making a dessert his mamma makes. The other day I had a ginormous ricotta container of Ricotta from Costco just hanging around in my refrigerator. I was going to make a different dessert with it. My sweet hubby said, “Chiama la mia mamma.” Call my mom. He wanted me to call mamma in Italy to get her ricotta filling recipe for the crostata I had made the day before. I was planning on a different filling for the crostata. But I also was feeling nostalgic for a dessert she makes us when we visit in the summer. My husband left his mamma in Italy when he was in his 20’s. My father left his mamma in Sicily when we was in his 20’s. They both came here to follow the big American dream. That is one of the few things my husband and father have in common. I often think about how I admire these two men in my life for leaving their country and not knowing a word of English. How brave they were to embark on a life changing adventure. Here is my dad on the right and my Zio Vincenzo on the left right before my dad left for America. Would I be able to do the same? I did live in different countries in my childhood and in my college years, but I knew the language. It was scary for me, but not as scary as say moving to Japan or India. I sometimes think: Could I move abroad to a country where I did not know the culture or the language? Could you? Have you? I’d love to hear about it. We do get to visit sweet mamma every summer. I know, it’s incredible. We enjoy every moment of the time together, as for the rest of the year, we are separated by a vast distance. My mother-n-law spoils us rotten with her amazing food. Teresa makes all her cheeses and salami. Her crostata alla ricotta is filled with her amazing homemade ricotta. I really like her spicy ricotta. Back in December, my dear friend Shulie and I had a fantastic double giveaway of Domenica Marchetti’s incredible book, Big Night In. You could read a little bit about Domenica here. I made cookies and Shulie made cookies and also a crostata. I had just made this Crostata alla Nutella for my first Daring Baker’s Challenge. It even got into the Foodbuzz Top 9! Woot! I wanted to try Domenica’s recipe as a crostata. Her cookbook is full of incredible authentic Italian recipes. I can’t wait for her new cookbook to be released…it’s all about PASTA! This dough is light and flaky. Buttery and tender when you put your fork in. The creamy ricotta filling has a lovely touch of tartness from the lemon zest and just the perfect amount of chocolate and a delicious hint of espresso! We had it for dessert. We had some more for breakfast and in the afternoon with an espresso. We shared some with our neighbors. My son declared, “I love your cheesecake mommy!” My hubby told me, “Non mi piacciono tanto i dolci con il peanut butter.” He explained, he’s just not that into my peanut butter desserts. But this…this makes his heart go pitter-patter. Roll out the remaining piece of dough to 1/8-inch thickness. Use a cookie cutter to cut out decorative shapes (stars, moons, or whatever you like) to adorn the top of the tart. Or use a sharp paring knife to cut out a lemon shape about 4 inches long and 3 inches wide, and a pair of oval leaves. Score the leaves lightly with the blade of the knife to resemble the ribs. Place the dough cut-outs on a rimmed baking sheet and refrigerate until the tart shell has finished baking. Set the cut-out stars in the oven and bake for 10 to 12 minutes, until the edges are lightly browned. * I made instead a lattice design. It is ok if it breaks a little and your pieces are uneven when you place on the top of the ricotta filling. It will expand while it’s baking and connect and you won’t know the difference. In a large bowl, mix the ricotta with the two egg yolks and sugar. In a large mixing bowl, beat the egg whites until nice and fluffy. Fold the egg whites, espresso, lemon zest, and vanilla into the ricotta mixture. Fold in the chocolate chips. Here is the dough all rolled out and ready to be put into the tarte pan. Roll the dough over your rolling pin. Now you carefully unroll it into the tarte pan. Trim the excess dough. I used the dough from that to make the lattice design. Here is the ricotta filling while I’m folding in the egg yolks. Now the egg whites and lemon zest get folded in. Gorgeous and ready to be poured into the crostata. The lattice is ready to be placed on top of the filling. Here is the bella crostata ready to be baked. Mmm! Thank you for stopping by today! I know there are more snow storms arriving tonight. Please stay safe and warm. Beautiful!!! I can only imagine how it tasted! And you make me smile! So very much! This is one of my favorite posts of yours…I loved hearing you talk about your family. And yes, both your sweet husband and father were so very brave! I love this dessert, and I love the connections it has to your husband's family. Thank you for sharing, Lora. Stay safe and warm tonight! I came to the U.S. in my 20s to live with my American husband and I am still experiencing cultural shock:) I spoke English, but it was still hard. Only when you are that young can you do something that adventurous:)I would not dare do it now! My eyes lit up when I read the title, I was so excited. I love ricotta cheesecake and I was thinking, this has got to be ever better because you get that layer of pastry on top of the custard! Both of my parents came to the US without any family or friends here, they had to learn to adapt all by themselves. We always went back to France every summer though to visit relatives, so I am very grateful for that. This is a gorgeous cake, love the texture here, and the instructions Great job this is right up my alley, a firsth loves here in cakes! My father left Sicily in his 20s to come to the US to marry my mom!!! (who left Sicily w her parents when she was 11). I always wonder how it must have been to start over in a new country like that. I love your post…and your dessert! I swear, I need a baking lesson from you. I need to come to your house for a weekend for Cake Duchess school! I know nothing about pastry dough or anything other than baking a cake or cookies. I would love to make this! I adore your lattice topping…so beautiful! Another delicious recipe…and extra special b/c it connects you to your Italian roots! I'm here, drinking my morning coffee… reading this beautiful piece. This story just brought a huge smile to my face. I'm sure your husband is a very happy man, Lora. Sounds and looks delicious. I love that you are playing with the italian foods so much, I am sure it makes your husband very proud! That crostata looks scrumptious! Especially on a frigid cold day like today! I made a torta di ricotta a few months ago and didn't really like it. Upon seeing the differences in your recipe though I think I just had a bad recipe. I didn't have chocolate chips in mine and think that would have been a great addition. Yours looks so delicious that I will have to give it another go some time! Great recipe for that big tub of ricotta :] Love the little touches in the filling, the espresso and lemon. Oh that looks so amazing and delicious and I want one right now! I love ricotta in EVERYTHING! Hey girlie, so nice to wake up to this story and you know I am such a crostata convert since I made Domenica's. Love traditions and this crostata looks so fabulous. Thanks for the mention Bella!! Looks fantastic, I can only imagine how good it tastes! I think it's amazing that your father, and your husband left the country they each knew for the great unknown. So adventureous! Nothing like making your guy happy and hitting a homerun! This looks and sounds incredible. I love Domenica's cookbook! Can't wait to make something else out of it. Looks delicious!! I've never made anything like this before so I'll have to give it a try..I love Italian desserts! Yum, sounds great – defnetely need to put this recipe on my "make soon" list! Wow this crostata looks amazing! My Nana makes something similar at Easter (her mother's recipe from Calabria). I love this, and I love aything with pasta frolla. I lived in Florence for a while, but I don't think that counts because I studied Italian in college. It was an amazing experience and it's so great that you're able to go back every summer to visit la tua famiglia! Ooh Lora this looks incredible! It's great to be able to bring a little culture to your cooking and baking 🙂 I would love to have a big slice of this right now! MMM I've never ever made a crostata before but that will be one of the many new things I try this year! You've done an excellent job! I could adapt nearly anywhere if I had to. And make the most of it as long as I have my daughter with me. Being away from my family would be nearly heartbreaking and usually I don't deal with big changes well but I would be grateful to have my girl with me and we would adapt. I would imagine we would embrace the local culinary dishes and traditions and find a way to adjust. I really hope you are having a good week! What a lovely post. Your background makes it all the more interesting. I definitely don't do enough cooking with ricotta. It's time to branch out. I love ricotta (filled) desserts and this looks delicious. i bet it made your husband do some gyrates of joy. That is one gorgeous crostata so delicately prepared! Love it! What a lovely tribute to your husband's Mamma. It sounds as though your summers visiting her are idyllic. What a gorgeous crostata this is! Mamma Mia I want a crostata! I laughed a lot really at your line about ginormous and Costco; just mentioned in a post recently about that being a common theme in my posts; glad I'm not alone! Beautiful story and equally beautiful result. Wishing I had that same ginormousness here right now! I have great respect also for people that come here from other countries without knowing the language. I am not sure I would be able to do that. Ooh this looks sooo good! Reminds me of a pie my grandma makes at Easter… awesome! Beautiful dessert Lora!! I absolutely love ricotta!!! I am alos jealous you get to go to Italy…I miss Italy. Fabulous! What a great post! It's so sweet that the most important men in your life both have the same origin. And it's nice that you still get to spend time with the people you love AND how could you not love that picture of your father! I love when I come acrossed photos with such memories attached. You crostata looks beautiful too! Your crostata looks amazing, I am sure your mother in-law would be more than pleased…And what a nice connection between your father and husband, or a similarity I guess 🙂 Lovely post! Lora this is really so beautiful. I love the story and the whole process of the entry. People who come to America to find something better do really astound me because i don't think i could ever leave all the people i love behind. I do feel like its quite adventurous to go elsewhere but over all i know this is my home. I love Italian culture, I'd like to travel to italy soon. they are such a strong/ beautiful group of individuals. thanks so much for sharing! simply fantastico!! I love ricotta torta's, I'm sure your mother in law would be proud of this delicious creation….my wife and I talk about spending part of the year in Italy, and I of course love Paris, right now its just a dream! Your crostata looks fantastic! I've never had one with ricotta and chocolate chips, but this is definitely going into the 'must try' pile. Thank you for sharing and congrats on Top 9!!! I love that your Dad an husband have their "American story" in common. What a great photo of your Dad, too! 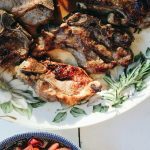 great recipe, great blog! 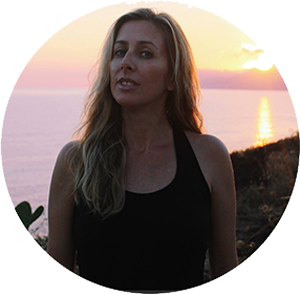 Lora, what a beautiful tribute to your husband's and Dad's voyage to the US … and a nice tribute to your MIL back in Italy. She's lucky her boy found the right woman! 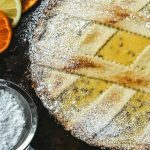 The crostata is beautiful and I bet it was a wonderful food memory for the whole family! Nice work! Fantastic post and the crostata looks divine! Thanks for sharing and congrats on the Top 9! Cheers! Looks good! I wonder, do your chocolate chips sink to the base or are they evenly distributed? Its hard to tell from the angle of the slice. Is the espresso, lemon, and chocolate combination traditional? It strikes me as an unusual flavor combination. How do you think it would be with an alternate citrus substituted? This is going on my growing list of things to make. Great blog and congrats on the foodbuzz top 9. What a handsome father you have! Your crostata di ricotta looks amazing…right up my alley. I've spent extended time in France but never really lived there. That is the place I'd like to hang my hat for awhile! Expert pie crust rolling I must say!! I love how the lattice interweaved with the ricotta cheese! Our family moved to Thailand and Shanghai in a culture so foreign to us. It was a great learning experience! You could totally do it!! Be still my heart, I have to make this for my mom, she will be so happy. My grandparents did the same thing, and I can only imagine how hard it was. This is an amazing trip down memory lane. Hope your week is going well. Your CROSTATA looks AMAZING! How fun that you get to visit Italy every year and be spoiled:) Your dad and husband have a lot of courage to come to a foreign country to start a new life. My parents were both the first in their families to be born in the U.S, and I have always lived here. My daughter-in-law bravely left the Philippines to attend college in Hawaii and eventually met my son in school:) We love her! The rest of her family is still there and she(and my son, and grandson) finally went to visit last year. Her mom and dad had come to visit, but she hadn't seen her siblings for seven years! Beautiful crostada! I bet it was even more delicious than it looks :)! Congrats on the top 9! I made your crostata today. It was amazing – and SO not like the desserts you get in an Italian bakery. This crostata was 1000 times better. The filling is so light, yet creamy. The chocolate and lemon are a perfect marriage – one doesn't overwhelm the other. I omitted the espresso powder because hubby doesn't like coffee. The crust was tender, also with a hint of lemon. I can imagine this crust in the summer filled with blueberries, or perhaps with half the ricotta filling (sans chips and espresso) and a layer of raspberry jam, or even a lemon curd with perhaps a light meringue. The possibilites are endless!!! Thank you so much for sharing! Being more of a cook than a baker, I found the dough a bit tricky to work with, but managed to get it rolled out. I think letting it warm up a bit (but not too much) after taking it out of the fridge helps. As far as a story – my grandmother had an interesting one – she came from Estonia with my grandfather when she was 22. She was a beautiful young woman, and had gotten offers to become a movie star in Estonia. She turned them down for love and a new life with my grandfather in America. This pie looks to-die-for! Your memories of Italy and family stories are so touching. I'm a new follower. I love your blog! 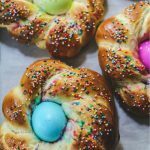 CIAO, I am a new follower, I happened apon your site looking for a recipe for Easter bread. The way you show how each step should look is a big help, grazie. I have been looking for a good cassetta recipe but can not seem to find one, unfotunitly my Nonna's recipe's were lost in a flood'd celler and I had not memorized them all. Hopefully you have one as your recipes are as clos to her's as they come. If you have one for wine cookies too , give it up, she never had one!! LOL everything was done by eye, she had a special glass the homeade wine went in for the mesurement, she just threw it all together and each time they were perfect and delecious, topped with granulated sugar these little twists of hard cookie were the perfect after dinner treat with a cup of perked coffee that she always did on top of the stove, and we always got to share in even as children. Of course we had mostly milk, but we were never left out of the after dinner treat.Oh how I long for those days now!!! Thank's again, and I look forword to new recipies, that take me back to my childhood, back to Italy, back to my Nonna. Ciao, This is my first time on your site and I love it!! Your recipes are just like my Nonna's, which I lost in a flood, but now have a chance to recoupe thank's to you!!! 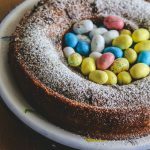 I found you looking for a recipe for Easter Bread, and I can't wait to try it this weekend!! Gratzi, Gratzi, Gratzi!!! !